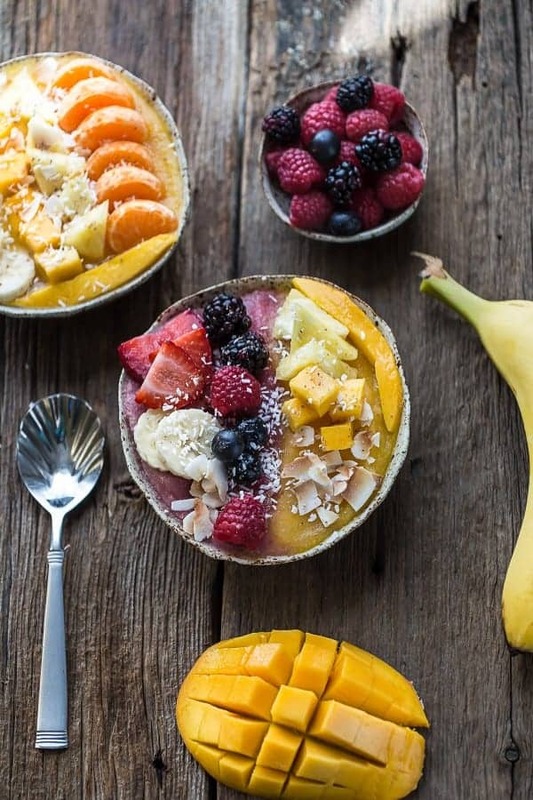 Berry Mango Coconut Layered Smoothie Bowl makes a healthy breakfast or snack. It’s the best of both worlds with two delicious smoothies combined into one bowl and loaded with fresh berries, toasted coconut, pineapple, mango and more! During the week, our mornings can be pretty busy with getting the kiddos up and ready to head out the door for school. I love getting up extra early before everyone else because that rare quiet moment is such a special time for me. It’s my “happy place” – a time for me to reflect on what the day holds ahead and also get in my morning workout. I also try to make sure everyone has a nutritious and balanced breakfast to start the day. Usually it’s a bowl of oatmeal, overnight oats or chia pudding along with a green smoothie. 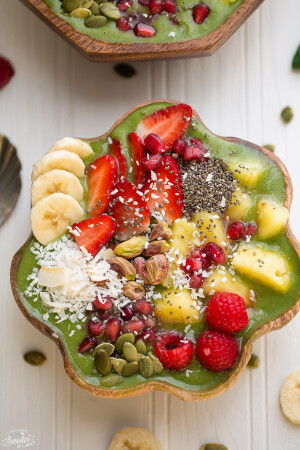 But sometimes I’ll break away from our regular routine and try to switch things up by making a fully loaded smoothie bowl. 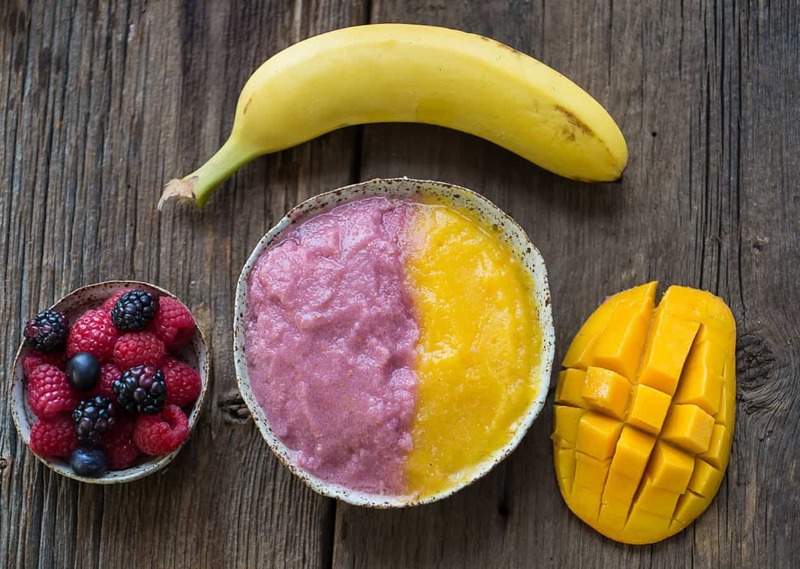 This Berry Mango Coconut Layered Smoothie Bowl is one of our newest favorites. The healthy burst of fruit and bright colors is another guaranteed way to bring all of us to that special happy place. It’s perfect for getting in that extra dose of fruits and hidden greens plus it’s super easy to customize with whatever toppings you have on hand. For the same split layered effect as pictured above, you would just blend each flavor separately and then pour them both into your favorite bowl at the same time. Then comes the fun part! The toppings! Raspberries, blueberries, blackberries and strawberries along with mango, pineapples and bananas. 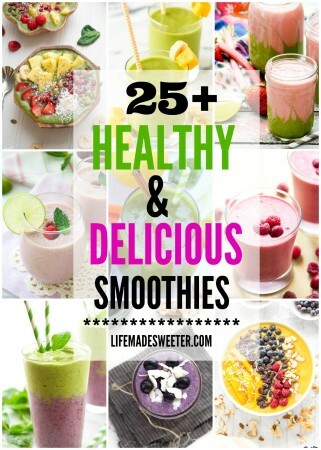 So healthy, delicious and good for you! All you need is your spoon and dig in! Berry Mango Coconut Layered Smoothie Bowl combines two delicious smoothies into one bowl and loaded with fresh berries, toasted coconut, pineapple, mango and more! Combine frozen mango and milk into a blender. Blend on high until smooth. Pour smoothie into a cup or bowl and rinse blender. Combine frozen mixed berries, spinach and milk into rinsed blender. Blend on high until smooth. Pour the two smoothies into a serving bowl at the same time. Add your choice of toppings and enjoy.